These are basically metallic, single-color koi. They should have a clear head without discolored spots, their scales should be neatly aligned, the fins - shiny, and the color should be consistent all over the body. In this category are included Ogon (single-color metallic koi) and Matsuba Ogon (these koi have scales that are darker in the center, forming a “pinecone”-like pattern, against a metallic background). 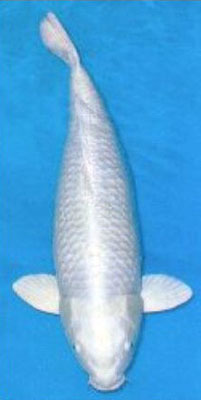 - Yamabuki Ogon: gold metallic koi. - Platinum Ogon (or Purachina): silvery-white metallic koi. - Hi Ogon: red metallic koi. - Orenji Ogon: orange metallic koi. - Mukashi Ogon: dark-gold metallic colored koi. - Nezu Ogon: silvery-gray metallic koi. - Kin Matsuba Ogon: gold metallic koi with pinecone-like pattern. - Gin Matsuba Ogon: silvery-white metallic koi with pinecone-like pattern. - Hi Matsuba Ogon: red metallic koi with pinecone-like pattern. - Orenji Matsuba Ogon: orange metallic koi with pinecone-like pattern. 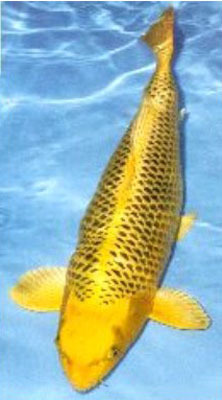 - Doitsu Yamabuki Ogon: gold-metallic koi with Doitsu scalation. - Doitsu Platinum Ogon: silvery koi with Doitsu scalation. 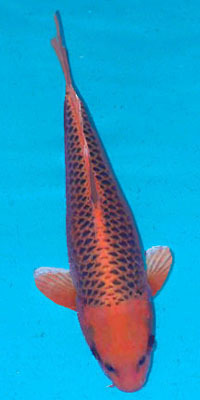 - Doitsu Hi Ogon: red-metallic koi with Doitsu scalation. 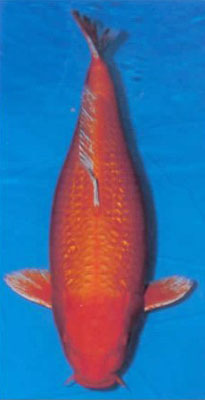 - Doitsu Orenji Ogon: orange-metallic koi with Doitsu scalation. - Doitsu Kin Matsuba Ogon: gold-metallic koi with Doitsu scalation but Matsuba-type scales. - Doitsu Gin Matsuba Ogon: silvery koi with Doitsu scalation but Matsuba-type scales. - Mizuho Ogon (Orange Doitsu Matsuba): orange-metallic koi with Doitsu scalation but Matsuba-type scales. Hikari means metallic. These are koi with one metallic color. Koi in this class include Platinum Ogon, Kinbo (shiny gold), Ginbo (shiny silver), Orenji (orange) Ogon, Yamabuki (yellow) Ogon and Nezu (silver gray) Ogon. All of those koi are solid color koi with metallic sheen. With no pattern to judge, all you have is a strict requirement for a clear head with no blemishes and a requirement for the color to be consistent from head to tail. The sheen on the fins, especially the pectoral fins, is important when judging ALL metallic koi. Hikari koi seem to have more problems with deformities of the mouth, fins and back than the other classes so look closely when you buy them. Also in Hikari Muji is the Kin Matsuba and the Gin Matsuba that have black reticulation in the center of each scale to form a pinecone pattern. We hear of Ogon, Hikarimono, and Hikari-mujimono. Although they mean virtually the same thing, "Hikarimono", which means "shiny ones", is the most general term. It includes the Hikari-mujimono, the Hikari Utsuri-mono, and the Hikari-moyomono which are all different types groups of koi that have a dull metallic luster. Hikarimono in a narrow sence, means the Hikari-mujimono. 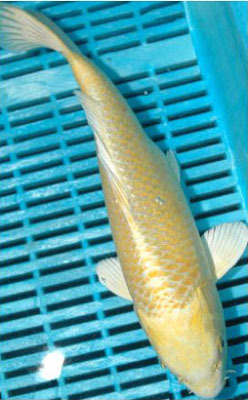 The term "Ogon which means "golden " is the oldest, and when used in its narrowest sence, refers only to golden koi. It may also describe all the Hikari-mujimono in a wide sence. Therefore, the word Hikari is almost a synonym of Ogon. 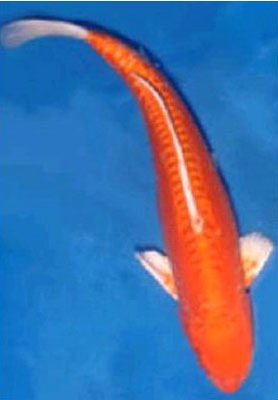 For example, an orange Hikarimono is called "Orange Ogon". "Hikari-mujimono", on the other hand, is the name used for one of the eighteen official variety groupings. As the word "Muji" means "single colour" or "plain", this grouping includes only the single- or self-coloured Hikarimono. In the A.K.A. there are 3 categories of Hikari-mujimono, namely Metallic Doitsu, Metallic Matsuba and Ogon. The Ogon have been crossbred with many other varieties, so that many gorgeous Hikarimono have been produced. Ogon are required to have a clear shiny head free of any discoloration or spots, and glittering pectoral fins. The metallic luster should continue to the edge of every scale, and the more it covers the body, the more excellent the fish is regarded. The Platinum Ogon have been improved so that today they have a deep, dull luster. They are the king of the Hikari-mujimono. Other types of Hikarimono have been bred from them. Their body is white with a platinum sheen. their head is supposed to be clear. Both the body and the pectoral fins are required to be shiny. Doitsu Ogon, the scales neatly aligned on the dorsal ridge and along the lateral line are exquisite. Large scales if they overlap one another are not worthy of appreciation, no matter how beautiful their sheen is. Excess scales on the sides look ugly. 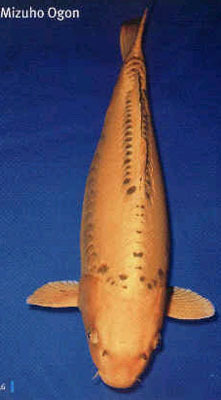 The Doitsu-goi of Platinum sheen are called "Platinum Doitsu", while those with a golden- yellow sheen, "Yamabuki Doitsu". Shiny orange Doitsu are named "Orange Doitsu Ogon", or "Orange Doitsu", while red Hikarimono of the Doitsu lineage are called either "Hi Ogon Doitsu" or "Hi Doitsu Ogon". Matsuba Ogon ( Kin Matsuba ) and Gin Matsuba are bred from Matsuba X Ogon, the term Ogon in combination includes both "golden" and "silver". Kin Matsuba are golden Matsuba, whereas the Gin Matsuba are platinum coloured. One point for their appreciation is that their scales should be neatly aligned. Gin Matsuba with a platinum sheen are noble looking. They are also required to have a clear head, brilliant pectoral fins, and a shiny body. The other Matsuba Ogons are the Orange Matsuba Ogon, and the Hi Matsuba Ogon. Doitsu Matsuba Ogon having the Doitsu Ogon body and colouring, but with black Matsuba scales along the dorsal ridge. If these scales are neatly aligned, and there are no excess shiny scales, the fish will be distinctive and quite striking. Matsuba Doitsu with golden shine are "Kin Matsuba Doitsu", while those with a platinum shine are "Gin Matsuba Doitsu". 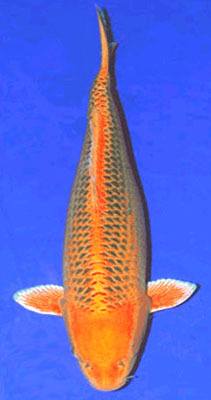 Orange Doitsu Ogon with black Matsuba dorsal ridge scales are called "Mizuho Ogon".